Images of a Kentucky hunter posing with the body of a black giraffe she killed in South Africa have triggered an online backlash after going viral on social media. 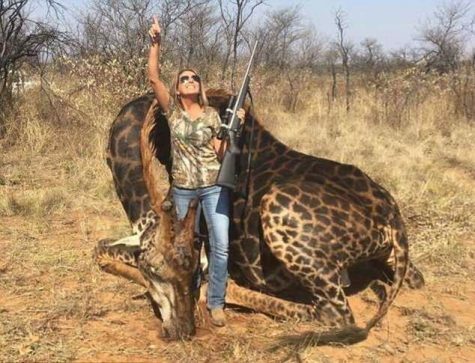 Thousands of Twitter users expressed outrage at Tess Thompson Talley, 37, for killing the giraffe on a hunting trip last summer. “Prayers for my once in a lifetime dream hunt came true today! Spotted this rare black giraffe bull and stalked him for quite awhile,” Talley wrote in a since-deleted post on Facebook, according to USA Today. The post said the animal was more than 18 years old, weighed 4,000 lbs and yielded 2,000 lbs of meat. On average, giraffes have a 25-year lifespan, according to National Geographic. Efforts to reach Talley for comment were unsuccessful. The pictures went viral only recently after being reposted on Twitter last month by the website Africalandpost. The online condemnation was swift. Comedian Ricky Gervais, who often posts about animal conservation issues, called Talley a profanity on Twitter and lamented giraffes being endangered. Talley defended herself in an email to Fox News in a story posted on its website, saying the giraffe was a member of a South African sub-species that is not rare. “The numbers of this sub-species is actually increasing due, in part, to hunters and conservation efforts paid for in large part by big game hunting,” she said. Big game hunting is legal in South Africa, where the industry and related tourism brings in $2 billion annually, according to the BBC. Giraffes were classified as “vulnerable” in 2016 by the International Union for the Conservation of Nature, which manages the list of endangered species worldwide. The number of giraffes in sub-Saharan Africa has dropped by nearly 40 percent since 1985, according to the organization. Talley is not the first American who has come under fire for big game hunting. In 2015 a Minneapolis dentist prompted fury for killing Cecil, a famous Zimbabwean lion. U.S. President Donald Trump’s sons Donald Jr. and Eric both enjoy big-game hunting, according to their father. Pictures of them posing with animals they had killed in 2011, including a leopard, drew criticism after resurfacing in 2016. In March, the U.S. Fish and Wildlife Service allowed for some big game trophies to be imported from Africa on a case-by-case basis, reversing a ban initiated under Trump’s predecessor President Barack Obama.